Epithema species are monocarpic herbs (they flower once and then die) distributed broadly in S & SE Asia (NE India, Nepal, Bhutan, China, Myanmar, Thailand, Taiwan, Philippines, Java, Timor, Moluccas, New Guinea). One species, E. tenue, is also distributed in W. Africa. Epithema typically grow on humid or wet limestone (less commonly on granite or quartzitic) rocks, in forests, at cave entrances etc. 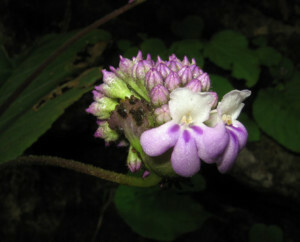 The genus occupies a rather isolated position within the Epithematoid Gesneriaceae (Weber 1976, Mayer et al. 2003). It is unusual in the architecture of the plant body, the inflorescences and in the floral and fruit characters (Hallé & Delmotte 1973, Weber 1976, 1988). Also remarkable is the disjunct distribution, with a gap from W Africa to India.